Island Peak Climb or Imja Tse Trekking Peak (6160m. ), one of the most famous and certainly most invigorating trekking peaks in Nepal and in the whole world is also named as Island peak. Imja Tse will enthrall you with its fabulous scenery and most appreciably, you will get a standardized viewpoint to watch the world's uppermost peak- Mount Everest. Magnificent panorama of immense Himalayas like Lhotse (8,501m. ), Nuptse (7,879m. ), Lhotse Shar (8,383m. ), and Makalu (8475m. ), Lhotse Middle Peak (8,410m.) in the east, Amadablam and Baruntse in the south welcomes you as you reach the Imja Tse Peak. Likewise, you will also pass the infrequently used Kongma La Pass and Chola pass. The best season for Island Peak climbing is spring and autumn. In 1953, Eric Shipton's group entitled the peak as Island since it looks a lot like an island in a sea of frost when sighted from Dingboche. And it was only in 1983, the peak was renamed as Imja Tse. To get to Island peak, you walk up the Dudh Kosi Valley from Lukla, moving through Namche and Tengboche then to Kala Pattar and Everest Base Camp. Here, you will view the nearest sight of Mt Everest and a mesmerizing landscape of sunrise over the snow-capped peaks on top of the Khumbu Glacier. Then, we shift down to Chhukung and get ready for the Island Peak climb. Plus, this trek is entirely planned for those adventurers who are energetic and physically fit. 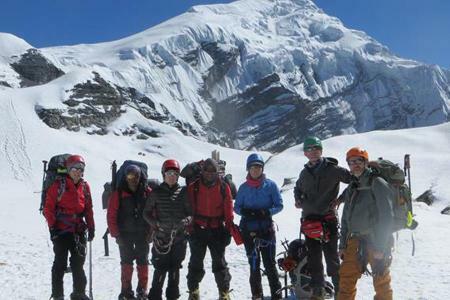 Let Unique Adventure to take you to Imja Tse Peak which has attention-grabbing and highly iced up West Face that towers from the Lhotse Glacier which in fact offers a wonderful experience fulfilling the reverie of any adventure fanatic. As soon as you arrive, you will be welcomed by our representative of Unique Adventure at Kathmandu International Airport but reassure about our representative with a display board at the arrival gate. You will be then taken to the hotel where you can either relax in the afternoon or hang around. You will have a dinner in a traditional Nepalese restaurant where we take pleasure in a Nepalese cultural program as well. We will be staying in a hotel for overnight. After having breakfast in the morning, optionally we can go for sightseeing tour. The Swayambhunath (the Monkey temple), Pashupatinath temple, Boudhanath; Patan Durbar Square, Bhaktapur Durbar Square and Kathmandu Durbar Square are the main sightseeing attractions in Kathmandu valley which are rich in art and architecture. 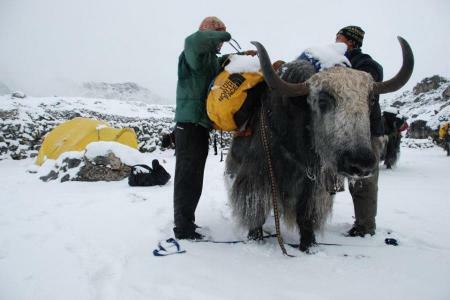 Or we will have a final preparations, official procedure and short briefing for the trek. We will stay overnight at a hotel in Kathmandu. Today, we will fly from Kathmandu to Lukla (2827m. ), witnessing a breathtaking view as we fly analogous to the enormous Himalayan bordering China and Nepal. We will land at a run way after around 40 minutes. The trek starts with a trouble-free walking downward to the Dudh Kosi River, where we connect the major route to Namche Bazaar. After passing via the small community of Ghat (2550m. ), we reach at Phakding. Overnight at guest house. Today we set off from Phakding and walk further on a small way up to Jorsale we get in front of a waterfall. Now, the trails villages are united with superb forest of giant firs, rhododendron and magnolia trees. Then, we walk to Namche crossing few bridges and climb a few hundred meters, a perpendicular drop and one steeper climb all the way through the forest. Overnight at guest house in Namche bazaar. We have a rest day in Namche Bazar today for becoming familiarized to the altitude. Namche is a prosperous village situated in a large protected hollow. From here you can observe the amazing panorama of the Khumbu peaks and most importantly see Mount Everest. Or, you can also go for a trivial walk towards Thami (3810m.) over the attention-grabbing Bhote Khola River Valley. Overnight at guest house in Namche Bazaar. After having our breakfast, we get on the track and move down to the river, Dudh Koshi. We keep on ascending through Rhododendron and Conifer forests up to Tengboche. The Tengboche Monastery is located on a ridge at an elevation of (3860m.) 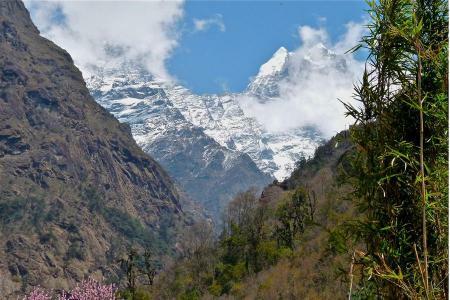 and is bounded by mountains like- Kangtenga, Thamserku and Ama Dablam. We trek for 3-4 hours today. Overnight in Tengboche. We today, slide down through the forest of birch, juniper, fir and rhododendron to the nunnery at Debouche. On the way, after crossing the Imja River, the path reaches to the village of Pangboche Here, we can have our lunch seeing the attractive peak of Ama Dablam. In the daytime, our route moves through open alpine hilly area before once again we cross the Imja Khola and then to the settlement of Dingboche. Overnight at guesthouse. From Dingboche we move to Chhukung today. It is located unshakably beneath a huge rock wall that joins Nuptse with Lhotse. 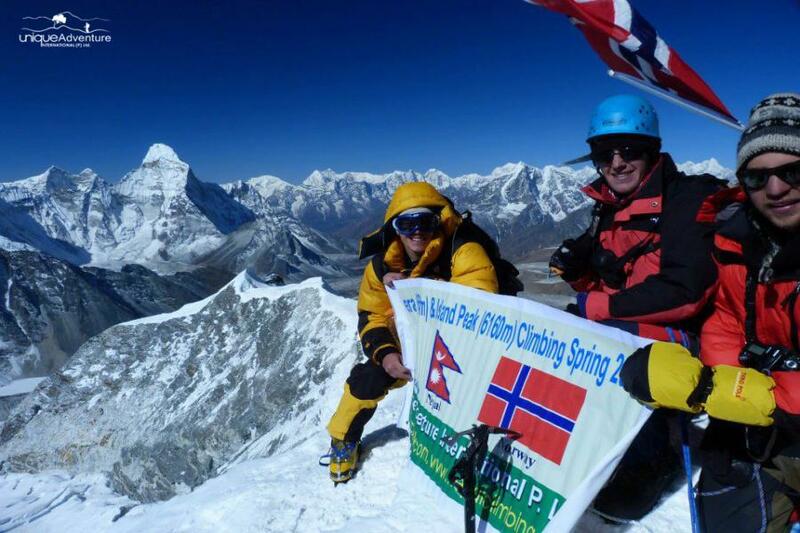 From here, you will also see magnificent views of Amadablam (6856 m.), almost surely, the most pictured peak in Nepal. We then walk by the side of the Imja River to reach Pareshaya Gyab, a pleasant spot by a tiny lake with a very well sight of the Nuptse-Lhotse wall and Lhotse Glacier. Once we arrange our camp, we can then geared with our climbing stuffs and get ready for your way up to the peak tomorrow. Overnight at tented camp. 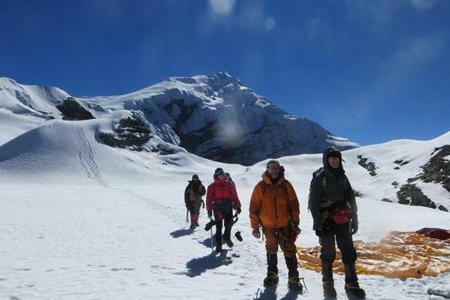 Ascending from the base camp we will reach to the Island Peak High Camp (5600m.). From this point, we can see semicircle view of cliffs that go up in the north to the rocky peaks of Nuptse (7,879m. 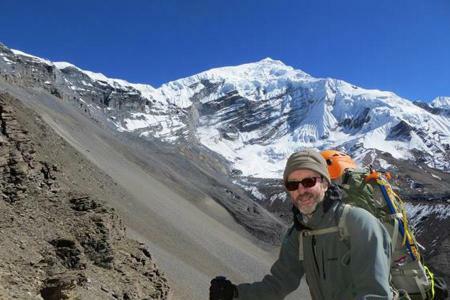 ), Lhotse Middle Peak (8,410m. ), Lhotse (8,501m.) and Lhotse Shar (8,383m.). To the east, we will view the iced up waves of the Lhotse Shar Glacier above which towers Cho Polu (6,734m.) 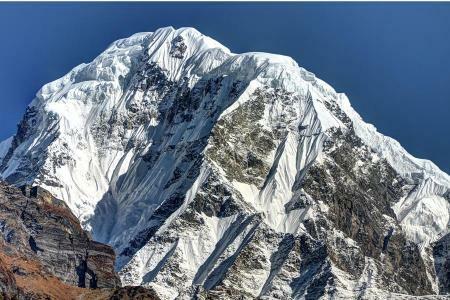 and we will also witness Makalu (8,475m.). From the south of the Imja glacier, we will be rewarded by Baruntse (7,720m.) and Ama Dablam (6,856m.). Overnight at tented camp. We will start ascending early to arrive at the summit and our route now gets complex once we arrive at the foot of the pointed icefall below the peak. Great care has to be taken while ascending the wall to reach on the edge which leads to the summit. After getting to the summit, you will move down to the Imja Tse Base Camp. We has set aside a day at the base camp just not to mess up our schedule because of bad day weather. Overnight again at tented camp. From Imja Tse base camp, we move to Pangboche today. On the way, we traverse the Khumbu Khola over a wooden suspension bridge and walk beside the Imja Khola to the village of Pangboche. We trek for 5 to 6 hours today. Overnight at guest house. From Pangboche, we walk beside the river and, after coming across we make our way up through birch and rhododendron forest to Tengboche. From Tengboche, we move down to the bridge above the Dudhkoshi at Phunki Tenga and then we return back to Namche. We walk for around 5 hours. Tonight at guest house in Namche. Day 15 : Trek to Phakding, overnight at guesthouse. From Phakding, we today follow the Dudh Koshi and arrive at Lukla. We take around 6 hours to trek today. Stay at guest house. We wake up early in the morning to take the flight for returning back to Kathmandu. On arrival in Kathmandu we are transferred back to our hotel. Overnight in Kathmandu at the hotel. Today, you have rest day for relax or you can also go for shopping in Kathmandu or you can do anything you like to by yourself. Overnight at hotel. Our airport representative will transfer you to the airport from the hotel for your way back to your destination.